"I lived to Beyblade, from the minute I got up, to when the sun went down. It meant everything to me." Those of us that can remember a time when Saturday morning TV programs entertained without being just a tie-in to cheap plastic toys may approach the new phenomenon of full-length commercials with a degree of cynicism. Beyblade is the most recent series to do this, repackaging an old idea with a new "spin," taking the toy top into the twenty-first century. The show gives these simple devices iconic status, with an entire livelihood centered around becoming a Beyblade champion, no doubt trying to inspire a hopefully gullible audience that they should follow suit. The ultimate goal is to win the world competition, going head to head against other teams, to see whose Beyblade comes out on top. 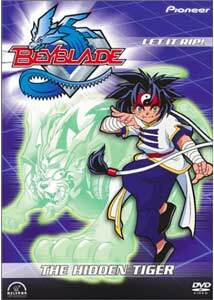 Of course, as anyone who has ever played with a top knows, they are pretty boring, so to liven things up, the players are given the ability to control them telepathically, and if that weren't enough, the more elite Beybladers have mystical beings that inhabit their blades, known as "bit beast," which are summoned forth to up the ante in the Beyblade battle arenas. As the story opens on disc three of the series, the championships are about to get under way, but Ray has ditched the Bladebreakers after losing his bit beast, leaving the team in shambles. Tyson decides to go out and hunt him down, buy Mariah is also out looking for him, hoping he'll return to the White Tigers. When Ray is finally found, it will take a showdown to determine his future. Back at the championships, the White Tigers face off against the Spin Shepherds, as Gary tries to send his opponent packing. Then, the Bladebreakers face forfeiture when an avalanche delays two of its team members. The story of Ray's bit beast, the White Tiger, is told as he and Li's background comes out, but Li throws down the gauntlet over its ownership, with the championship title determining the keeper. The heat is on to find out who'll claim the Beyblade crown. My first exposure to an actual Beyblade was at a family gathering, where an enthused nephew tore open the packaging on his new arena, promptly breaking it within minutes. If nothing else, Beyblade affords parent an opportunity to discuss media manipulation and fads with their kids, demonstrating that the real purpose of the show is to get parents to part with their hard earned cash for some junky piece of plastic. While on a grander scale, the notion of trying to do one's best is noble, and in some respects it does offer a few positive messages, such as the importance of friendship, teamwork, and working towards a goal. However, the show's agenda also builds the illusion that spending all your time perfecting your skills with the toy will make you popular, and it is guilty of perpetuating racial stereotypes, as this disc demonstrates that the native Hawaiian team, whose character designs are reminiscent of the caricatures of blacks in the 1930s, are so poor they have to use plywood to make their blades, while their caucasian rivals can afford computer laptops to assist their designs. Beyblade also gets demerits for the pranks it tries to pass off as funny—stuffing a red chili pepper in your sleeping friend's mouth is not something that should be encouraged, and frankly this kind of content in a show aimed at impressionable kids is highly irresponsible. The animation isn't bad, but there is little in the stories to hold anyone's attention. Tops aren't exactly the most interesting thing on the planet, even when enhanced by spirits or control from their owners (which is, of course, not included in the purchase price). The plot is pretty thin for the most part, and completely predictable. While kids will probably go gaga over it, their parents may not be as enthralled when they have to budget for the toys it is selling. Image Transfer Review: The transfer here is very good, with nicely saturated color, and decent black levels. Aside from a bit of aliasing, there is nothing to really complain about in the video department. Audio Transfer Review: English audio has a decent stereo soundtrack. Dialogue is easy to understand, and the sound effects and music cues come across cleanly and well defined. No problems here. Extras Review: Extras are pretty slim, with a profile section for the Bladebreakers team, a 30-second TV promo for the series, a 20-second ad for an electric launcher, and trailers for Sugar, Cardcaptors: The Movie, Catnapped!, Magical Project S, Panda Go Panda, Sherlock Hound. Let it rip indeed. Beyblade is another in a long line of product promotional series, geared to recruiting new legions into its fold of commercial exploitation. For the unwary parent, it represents yet another expensive and shallow trend whose novelty will wear off just like those that came before it, with a trail of broken toys you'll be flogging at the garage sale.